A Viking drinking horn brings back the times that glass was not available and the product to drink beer out had to be a sturdy beer horn. If you like to see your own home brewed beer served in an original way and impress your friends this is a great idea. These medieval beer horns are also a great gift for any beer lover. They can of course also be used as a drinking horn for wine or any other beverage. 4.3 How To Clean A Drinking Horn? When you are looking at the drinking horns for sale you see two types. A regular Nordic drinking horn that you hold in your hand or a Viking drinking horn with stand. 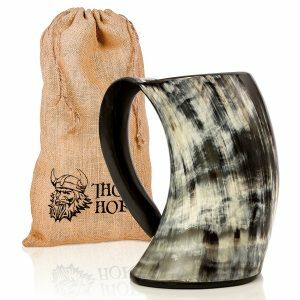 Although you can buy a Viking drinking horn holder, I think it is best to buy one that comes with it if you use the beer horn that is not flat at the bottom an can be set on the table. Like always we only looked at the Viking beer mugs with at least a 4 star rating from a high number of real users. We have found 3 beer horns that met those qualifications for you. Made of a solid piece of horn you can call this an authentic beer horn. No mass production and every horn is unique in color and shape. Food safe interior thanks to the food grade lacquer coating. 20 Oz large and this will allow you to drink beer like a real viking. This handcrafted horn is available in 3 sizes. 16oz, 20oz and 36oz because there is no one size fits all in the world of Vikings cups. Cut from a solid piece of horn means that no one of these cups are the same in shape or color. This beer horn comers with a 100% guarantee and if it has a leak or any defect it will be replaced free of charge. This horn is available in two versions. Engraved drinking horn with 4 rings and looks real nice. This ox horn mug is made of a real Ox horn that come from a veterinary safe and healthy livestock. Holds 24 ounces. Each design is original and no other mug is the same. For the real feeling of the free Viking spirit There is only the way of drinking. That is drinking from horn that is not altered to have a base to set it down. 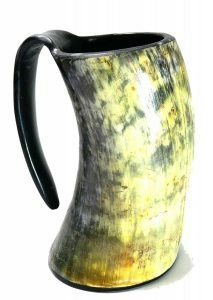 They come with a separate Horn stand and I personally like these drinking horn and stand a lot. Lets have a look at the 3 that I think are the best bang for your bucks. 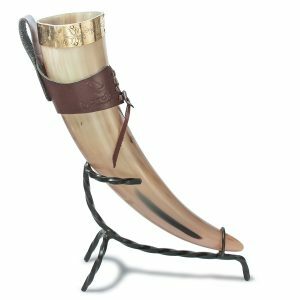 This beer horn comes with a stand that is also made out of Ox-horn to give it the authentic look you see in the medieval movies with the Vikings in it. About 12 inch high and will hold about 16oz of your favorite brewed beer. Interior is of course coated with a food safe layer to protect you. Every horn and stand is a unique design and made of high quality Ox horn. Medieval style large drinking horn made from Buffalo horn with a stand made from the same material. 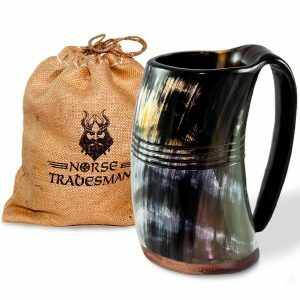 like all others this Thor horn mug is also coated with a food safe and non-toxic layer inside for your safety. The Buffalo horns come from India and are handcrafted for a very original shape and color. The handcrafted production makes it that every horn is slightly different. To be honest this is my personal favorite. The combination of the nice drinking horn and the metal stand makes it stand out in a crowd. The stand is iron forged and fits the horn great. If you need it this one also comes with a leather belt holder to take your horn with you. Of course it is leak proof and the applied food safe layer inside will assure that. The brass edge at the top is a real nice looking feature and will guard your lips. 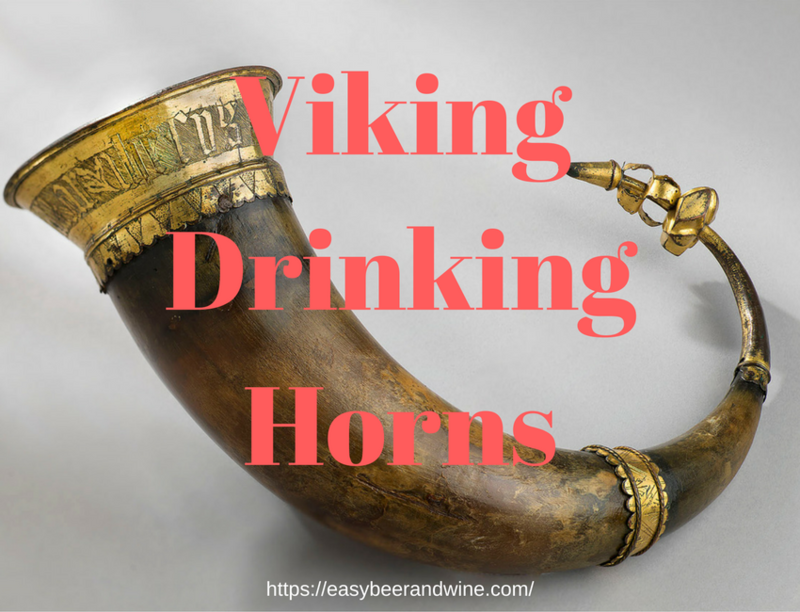 There are a few things you need to know when you use a Viking beer horn. It is not the same as glass or Ceramic and need a little different approach. I found a video on how to drink from a horn without making a mess. 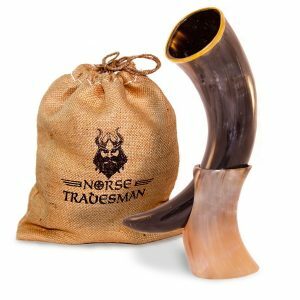 Looking at the history of viking drinking horns The history shows that these drinking horn we are talking about were mainly used by the people with a higher status and in many cases for a ceremonial purpose. The lower class had no money for them and used clay baked cups. Although in many movies it looks that all people used them this is not the case. 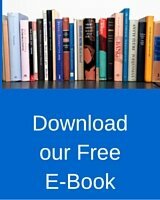 There are pictures from the ancient Greek with people holding a horn to drink from in their hands that go back to as early as around 480 BC. We in the western world now have the idea that they came from the Vikings, but I guess this is related to the idea we have that all they did was fight wars and drank home brewed beer out of these drinking horns. How To Clean A Drinking Horn? Cleaning a drinking horn is not hard but because of the shape it needs a little more attention. Soak it for a while in hot water and dish soap. Rinse it our very good to remove dish soap residue. Let it dry real good. Some tips I found recommend the use of a denture cleaning tablet for his viking horn drinking cup and let is sit overnight after a couple of times of using it. You can find more products for brewing beer here in this category.